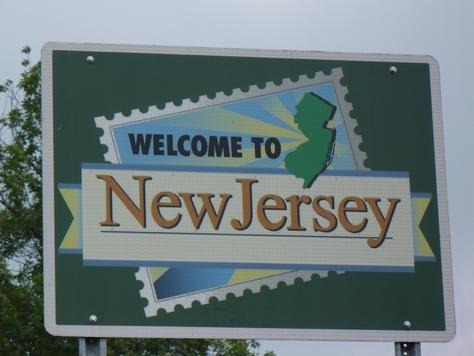 I know that a lot of people like to jokingly poke fun at New Jersey from time to time (c’mon… admit it… they even had a NJ joke in Madagascar 2 and that was a kids flik), but do some people really think that NJ’s citizens are actually that dumb? Apparently, some of them do – including Joseph Cryan, Assembly majority leader and representative of NJ’s 20th Legislative District. Whoops! Wow. So, let’s get this straight: according to Cryan, if they allow direct shipping in NJ, then they not only succumb to the “bullying” of out-of-state wineries, but will lose upwards of 60K jobs, will put the state’s children into rehab (supposedly they’re getting smashed on La Tache at, like, $3K/bottle?) and will miss out on an ungodly amount of revenue? The trouble I have with all this nonsense is not so much that it’s nonsense, or that Cryan got it all wrong – which he did: direct shipping experience in other states has shown that none of those things are likely to happen (for more on why Cryan’s take is off the mark, see my friend David White’s rebuttal). No, what irks me is that Cryan apparently thinks that his own constituents are dumber than bag of hammers. Part of the fun of jokes about NJ is that we now the people who live there are actually smart, and nice, and that the state isn’t a toxic waste dump, etc. (nothing personal, NJ people… it’s just that making fun of NJ is kind of what we do sometimes in NY and PA when we’ve had too many beers… I know, it’s terrible…). Why do that? Why even go there? Why treat your own constituents like dim watt bulbs? I mean, if they’re savvy enough to want to order wine from their favorite producers, wines they couldn’t otherwise get in NJ, then aren’t the smart enough to search on the Internet and find information and study results that refute Cryan’s scare-tactic defense? 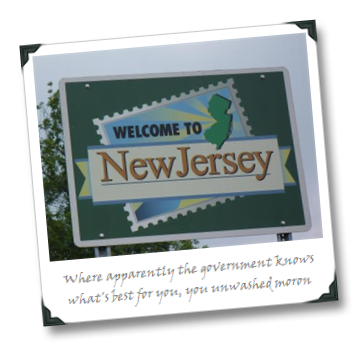 There is certainly something stupid going on in NJ, but it’s not on the part of their wine consumers – it’s on the part of some of their legislators. You deserve better, Jersey, and you know what to do if you’re a wine lover: vote ’em out! not to mention there's wine library and gary's right in-state… both having huge selections, competitive pricing, and large out of state footprints. i'm sure they're really shaking in their boots that you can order your SVC Santa Rita Hills Pinot off the mailing list. Joe: Awesome, awesome post. Thanks for the shout-out! I've got a longer (and angrier) take-down of Asm. Cryan going up later today. Turns out every single point in his oped is a lie. As one might guess, his largest campaign contributor is NJ's largest liquor distributor. Since 2006, Cryan has collected more than $50k from a single company — which just happens to be leading the charge against direct shipping. Pretty gross. As a NJ resident (not sure how I effect the state IQ level), I find the argument against direct shipping a complete and utter joke. I think Tom Wark has done a brilliant job revealing the flaws of the three tier system and am very pleased that you and others have also used your position to reveal the truths behind this issue. Thanks, Dude! AMEN JOE! Thanks for this article!! Here you are seeing how ridiculous it is not to ship to NJ consumers but don't forget the other side of it that NJ wineries can't ship out of state or in the state either! 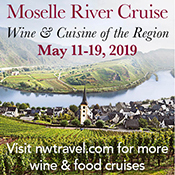 So not only are they treating their constituents like dim wits, but they are threatening the GARDEN states biggest potential for agrotourism, wineries! The bill that doesn't allow direct shipping also threatens to close down the tasting rooms. Because of this legislation several wineries that were promised licenses to open are now sitting on thousands of cases of wine that they've poured their life savings into. You tell me what's fair Cryan, the big liquor stores losing a sale or two to people that are collectors and buy their wines online or the wineries that were promised licenses going bankrupt? Jan – if that's true then it's a terrible state of affairs. Control states, and/or those with legislators who are in the back pocket of those who support the current unfair systems of alcohol distribution, seem to be quick to apply a one-size-fits-all solution (i.e., if we can't allow in-state wineries to ship if out-of-state don't, then screw the in-state ones too) that cripples the budding wine businesses in their own backyard. Hardly seems a balanced or noble cause, does it? Thanks, Tina – It is sad that it is a taboo subject in some places. But then, so is evolution, and that is a far sadder state of affairs. *Sigh* is right! "Someone is Cryan Sour Grapes!" A Cryan Sham(e) is fantastic – wish I had thought of that one! ugh. At the NJ wine festival this year there were petitions to allow shipments, which got tabled for discussion. So frustrating. Carinne – you mean the petitions got tabled? Or the petitions got signed but the topic wasn't taken up by the legislature? Why the silence on what's going on in your home state? PA – I've hardly been silent about that, as I think you know, having commented yourself on several of those posts! :) If you mean that I've been silent about the latest happenings in PA, it's only been here that I've been relatively quiet – on fb and twitter I've been linking / commenting on that stuff as recently as this week. With an actual bill being introduced, hearings taking place, etc… we need all the publicity possible to turn privatization into a populist movement. With your vague announcement on someone else's blog that you were taking up some type of advisory role, I feared (fear) that you'd gone over to the dark side. BUT… maybe it's worth highlighting Lew's blog again here in a proper post. @mariepayton – HA! As a PA resident, I feel your pain. Deeply. We need to keep fighting, vote out the people who are in the back pockets of distributors, unions, whatever, and vote in the people who will commit to changing in favor of an open market. Hey Joe – just catching up and saw your post on this subject. The way I look at this situation is very simple: if direct shipping is allowed, the three-tier system in NJ will survive just fine; if direct shipping is not allowed, and Jersey follows the court ruling, many wineries may not survive. I can't see how the state legislature would essentially kill a growing industry…but stranger things have happened.